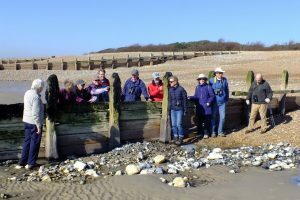 On February 26th, a glorious sunny day, twelve members of the Conservation Group met at the south end of Sea lane in Ferring for a walk to Goring. An initial excitement was the spotting of a Merlin, our smallest raptor. David Cambell, a local expert, pointed out the bird which was sitting in a tree half way up Sea Lane. This is a very unusual sighting for the Gap and illustrates just how important this green space is for birds . We set off towards the sea which was a long way off and the going was tricky with slippery rocks and pools of water. 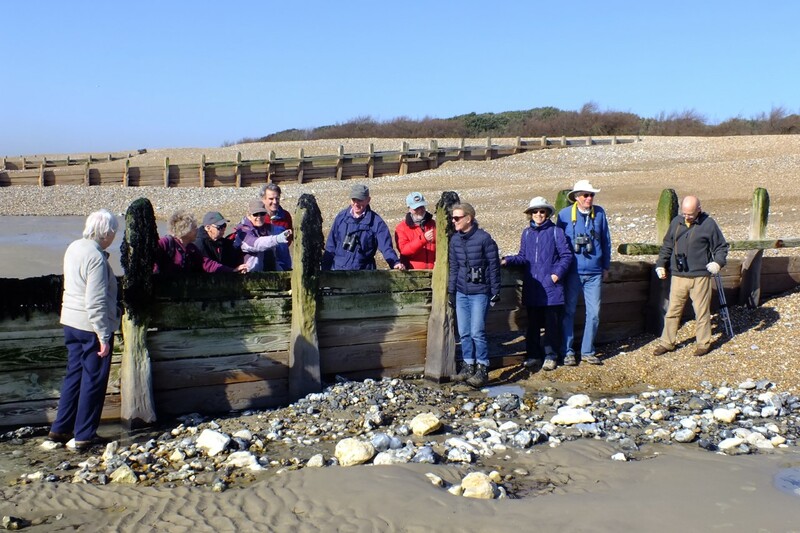 We stopped to examine the end of a breakwater which revealed a mini habitat of Spiral Wrack, Cladophora (a green seaweed), Common Limpets, Barnacles, Mussels and Periwinkles. We searched under rocks and collected a variety of organisms stranded on the beach. This flotsam included Ray and Shark egg cases, Cuttlefish ‘bones’, Slipper Limpets and other mollusc shells and the colonial animal Hornwrack which looks like a dried seaweed. We eventually abandoned our efforts to reach the sea and made our way to the Sea Lane cafe for coffee along the top path. On the return trip, the sea was coming in and so we were able to observe Oystercatchers, Dunlin and Sanderling on the tide line and Turnstones camouflaged against the rocks. Artist Tricia Hall painted a Christmas card of Ferring for members to purchase at their meetings. It featured the beach huts in the snow. Many of the cards were also sold by Margaret Metcalf at St. Andrew’s Church after Sunday services. A total of £560 was raised and the cheque presented to Chestnut Tree house Hospice by Tricia and our chairman, David Bettiss. 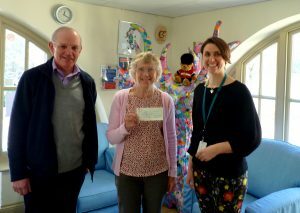 Many thanks to everyone who bought cards and thus contributed to this worthy cause. This is the eighth year that we have supported this charity through the sale of Christmas cards. 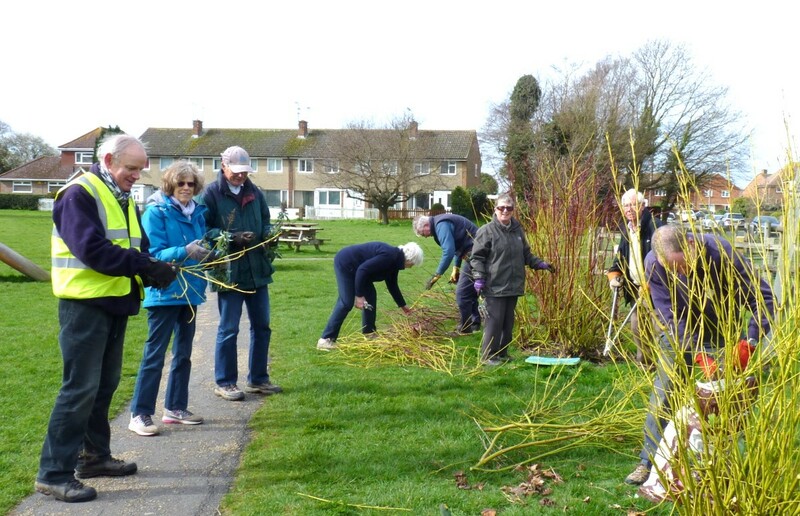 Nine members met on the Village Green for their regular 1st Tuesday of the month conservation work. 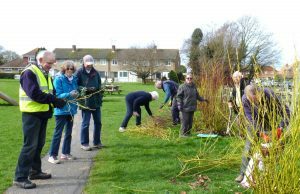 This session involved the trimming and cutting back of various shrubs and weeding the herb bed. If any other members would like to join this group, they would be very welcome. As a contribution to St. Andrew’s Church’s 1250 anniversary, FCG have constructed a herb bed based on a cartwheel design. The bed is on the village green and is just in front of the children’s playground. The bed is for fun but we hope to provide informative labels and the herbs have been selected for their attractiveness to bees and other insects. We have planted medicinal herbs which were made into tonics, potions, purges and salves (ointments). Feverfew, for example, was used to treat headaches and was also for joints and digestive problems. It is also a good nectar and pollen source for bees. Dyeing plants were those from which the medieval housewife extracted dyes for colouring cloth. Woad was an important source of blue dye and was used to colour clothes and tapestries and was also a pigment for blue paint. A thousand years ago homes, of both poor and rich people, were remarkably smelly and dirty. Strewing plants were those that were scattered on floors, with rushes or reeds, to mask smells and keep insects at bay. The rushes and reeds helped to soak up all manner of spilt liquids (animals usually shared the homestead), but, were often only changed twice a year! Lavender was strewn on floors for this purpose and was supposed to repel moths. It was also a personal scent and was used in baths when one was lucky enough to get one! We have planted many culinary herbs which were used in cooking and most of these are familiar to us today. These had important other uses as well so the medieval housewife had to be very knowledgeable. It was her duty to sow, plant and tend her garden. Mint, for example, was an aid to digestion and was made into a sauce. It was also used for cleansing wounds, as a cough mixture, and was added to vinegar to make a mouthwash. It also deterred vermin. We are grateful to Benton Weatherstone who gave us free bricks for the construction, Ferring Nurseries for the compost and Culberry Nurseries at Angmering for their advice and providing many of the herbs at very reduced prices. Please come along to see our herb bed and watch how it develops. When it is growing well, we may even allow you to snip a few herbs for your own use as long as you promise to pull out half a dozen weeds at the same time!